Spain is one of the least dog friendly nations in Europe, in my opinion. From public transport to public beaches you’ll find 'No Dogs Allowed' signs, but that doesn’t mean you can’t enjoy a great beach holiday with visits to some of Catalonia’s most beautiful cities at the same time, says dog lover and travel writer, Paul Wojnicki, who has travelled across Europe with his family and dog, Falco, many times. France’s Côte Vermeille, just across the border from Spain’s Costa Brava, is a lovely stretch of coast, easily accessible from Paris and less than a two hour drive from Barcelona. 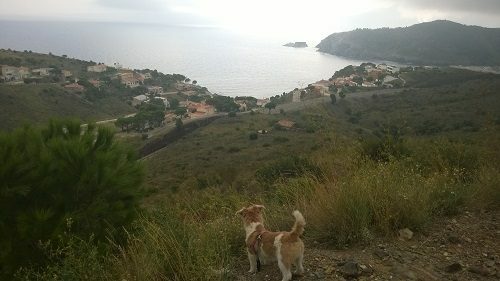 Argelès-sur-Mer is a magnet for campers and a great base for dog owners. With numerous upscale, four-star campgrounds, most featuring pools, on-site restaurants, bars and shops this is the place to be in the Côte Vermeille. Collioure is a small town, with ochre rooftops and a castle at the edge of the shore. So picturesque is the town that it sparked a new art movement known as Fauvism, which attracted artists like Picasso to the area. They hung out at the bar of the Hôtel-Restaurant les Templiers, which doubles as an art museum now, but is still a dog friendly hotel as well. Dogs are allowed on the north section of beach. Banyuls-sur-Mer is a village with numerous wineries perched behind it. The narrow Allées Maillol are where local artists ply their craft. It is worth visiting just for the splendid panoramic view of village, sea and mountains. It’s also the last port before Spain and a good stopping off point if you want to enjoy the spectacular coastal drive across the border to Port Bou on the Costa Brava. Drive or take the train to Spain - The drive from Banyuls-sur-Mer to Port Bou in Spain is simply stunning. The road meanders up vertiginous mountains with views of the Mediterranean below as you negotiate dozens of hairpin bends. It’s not for nervous drivers, who could always opt for the much less dramatic train ride instead. The train takes 25 minutes from Argelès-sur-Mer, 20 minutes from Collioure or 12 minutes from Banyuls-sur-Mer. You could even drive a little further to Barcelona, Girona or Figueres, the latter of which is only 40 minutes south of Argelès-sur-Mer and hosts the surreally shaped Dali museum. Take a boat trip - Take a glass bottom boat trip, or even a boat to the Costa Brava in Spain with one of the numerous operators at Port Argelès. Roussillon Croisieres operate half day and full day trips from Port Argelès to Spain, dolphin watching, local caves and many other local destinations - www.roussillon-croisieres.com. Carcassonne is a medieval fortress settlement within 90 minute’s drive of the Côte Vermeille. With over 3 km of walls and 52 towers, it resembles a fairy tale fortress and it’s hardly surprising that Robin Hood: Prince of Thieves was partly shot here. Almost all of the walled town is accessible to dogs and it makes a fascinating side trip, especially for those taking the Auto-Train to Narbonne, which is only 40 minutes or so away. The easiest way to reach the Côte Vermeille is via a sleeper train from Paris. The Intercités de Nuit night train from Paris stops at Argelès-sur-Mer and Collioure. Cabins for 2 people cost from €170 each way and arrive at around 8am. If you’d prefer to take your car then the same sleeper train stops at nearby Narbonne. It’s possible to transport your car using SNCF’s Auto-Train service from Paris to Narbonne, which transports your car overnight on a separate train while you sleep on the night train. Residence Maeva Port Argeles, Rue Eric Tabarly, 66700 Argeles-sur-Mer- With a fantastic location right behind the port this is a really handy hotel for bars, shops, restaurants and boat trips. It’s also very close to the dog friendly section of beach. The rooms are large and have balconies overlooking the port, there are also cooking facilities which is handy if you’re on a budget or don’t like eating out a lot. Rooms start at around £50 a night. Bontemps Paul, 6 Avenue du 8 Mai 1945, 66700 Argelès-sur-Mer. Tel : +33 4 68 81 04 26. Benhamdine Stéphanie, 3 Rue des Hérons, 66700 Argelès-sur-Mer. Tel: +33 4 68 89 20 02.